I said it with a smile on my face and in my voice. I said it lovingly and in jest…mostly. They knew I was joking and as preteen boys, they fully appreciated the irreverence. As the son of a Christian educator, and the sons of long-time devoted volunteers, these are feral church children, entirely at home in every nook and cranny of our large cathedral complex. It’s wonderful knowing that God’s house is as familiar to them as their own homes, and that the nave itself is their favorite place to play hide and seek. They were supposed to be helping our youth minister bake cookies for decorating at our last Cathedral Night before Christmas break. We celebrated Saint Nicholas tonight, as his feast day followed the next day. 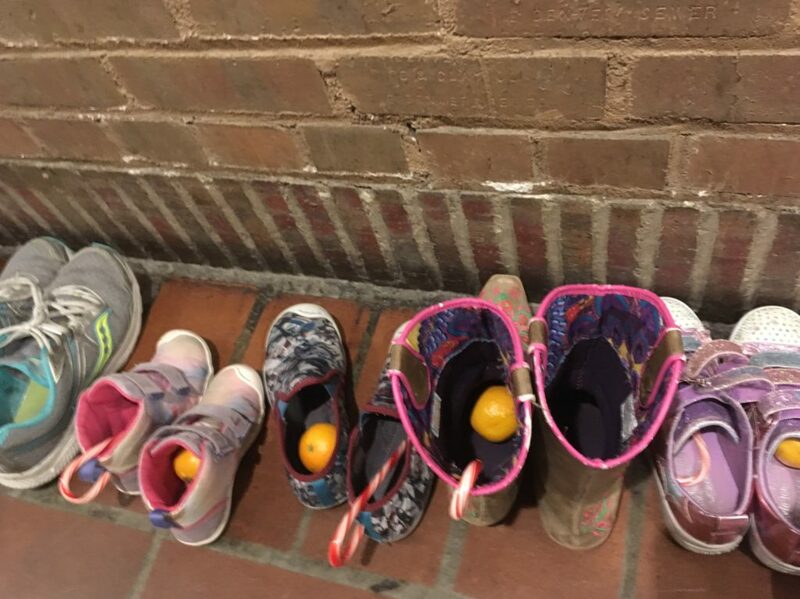 As they came from choir rehearsal to supper, children set their shoes in the hallway, so our elves could fill them with oranges and candy canes. Many of these kids had never experienced this tradition before; there was confusion, even distrust. One very thoughtful little guy asked if he’d be allowed to put his shoes back on before going home. The faces when they saw their shoes filled with small treats were nothing short of magical. A few days into Advent, I was feeling energized yet vaguely frantic as I grasped for an hour of quiet to check off at least one or two items on my growing to-do list. My time this week has gone to building relationship with parents and youth, planning events that will foster faithful community, finalizing Advent and Christmas worship that will nurture our congregation as they seek Christ in this most holy season. Time undoubtedly well spent, yet the pressure of that list staring accusingly up at me from my desk blotter rests weightily on my conscience through every moment. How often do we, as parents and in our jobs, fight that feeling? Knowing that what we’re doing is important, even sacred when it comes to relationship, yet weighted by the pressure of what has been left undone? There is so much I hoped to do during this Advent, for my own kids, for the children and families in my ministry, and yes, for myself. And as always, come Christmas morning, some of it will have to be put away with vague hopes and promises of next year. But there is good news, I realized after kicking those boys out of my office and watching them gleefully race each other down to bake cookies (or not). They are fully immersed in Advent because they don’t see the list of things left undone. They have Advent wreaths on their tables (made at last week’s Cathedral Night), have lit the first candle and said the first prayers. They heard some stories of Saint Nicholas tonight, and talked about both the logistics and the rightness of giving to others with such glee. They decorated cookies and found treats in their shoes in his memory. They did this in community with a gathering of people who love and affirm them, and who stood at many of their baptisms promising to raise them in the love of Christ, with God’s help. And then they played hide and seek in the nave. As we continue to move through Advent, here’s a new practice I want us all to attempt: let’s embrace a messy and imperfect observation of the season. The only wrong way to doAdvent is by not doing anything. You don’t have an Advent wreath on the table yet? So what, put one there today. Can’t find purple and pink candles? Put purple and pink craft sand in clear votive holders in a circle on a plate, add plain white candles, and you’re all set. Go to www.adventword.organd sign up for the daily reflections. 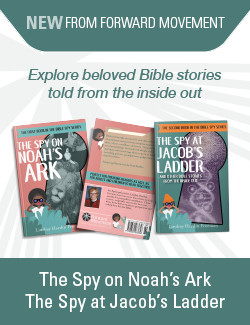 Share them with your children and ask them to look for and think of examples of the word of the day. The first word this year was #journey. Embrace your journey this Advent, no matter how imperfect and messy it may be. After all, reaching Bethlehem is only the beginning. If you have a church home, go there. Take your children to Advent and Christmas services and events, and envelope yourselves in faithful community, even when it’s messy and imperfect. If you don’t have a church home, this may be a great season to explore finding one. Use websites to find congregations that prioritize children, youth, and families. Advent is about the journey, not the arrival. And raising our children in faith is a messy, imperfect, but holy journey. Thank you so much for this!!!! I was feeling guilty – for example last week I didn’t even make it to church because I was sick. I don’t have my advent candles up. I usually cut little branches off my Oregon grape plant to put on my mantle and then add the candles (anywhere else the cats attack.) I haven’t even figured out any presents. And my husband and I own an art gallery and people are in buying gifts. Your post helped a lot. I picked hymns for this coming Sunday and sent them to the worship leader. I practiced said hymns on the piano and this afternoon I will go to the church practice them on the Organ and leave the music on the bench. I need to really remember one of my major life slogans – One Day At a Time.